I will try to keep this review short and sweet, as there’s no need to gild this lily. Babica Hen Cafe makes the best breakfast I’ve had in my home state of Oregon, period. Ironically, it wasn’t the breakfast I planned to eat; it wasn’t even the breakfast I ordered…but it was awesome! A lazy Sunday morning, scanning online reviews for a new place to take my family for breakfast, I find some very nice things said about a place called Babica Hen Cafe, about 15 minutes from my house. 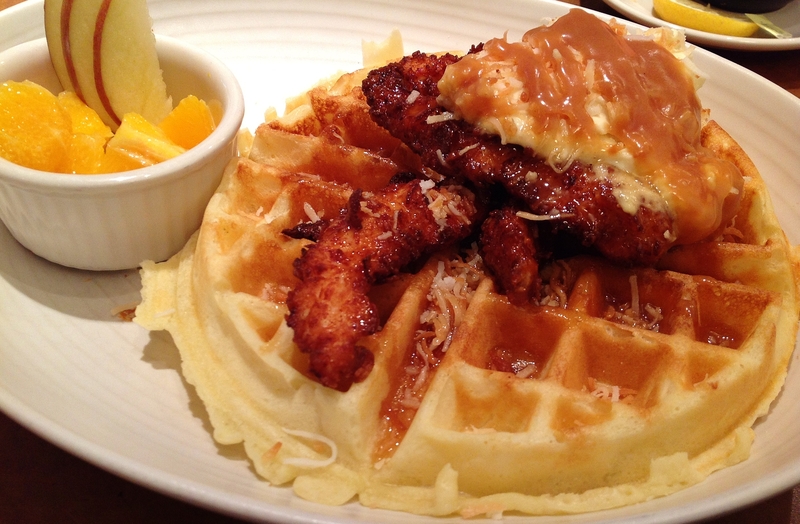 The positive comments and the words “Fried Chicken & Waffles”, sealed the deal. 1) Expect to wait. We were told 30 minutes (turned out to be 15), and were lucky that the weather allowed us to sit outside. A complimentary coffee bar for those waiting for a table was a very nice touch, and hinted at the level of customer service we would soon experience. 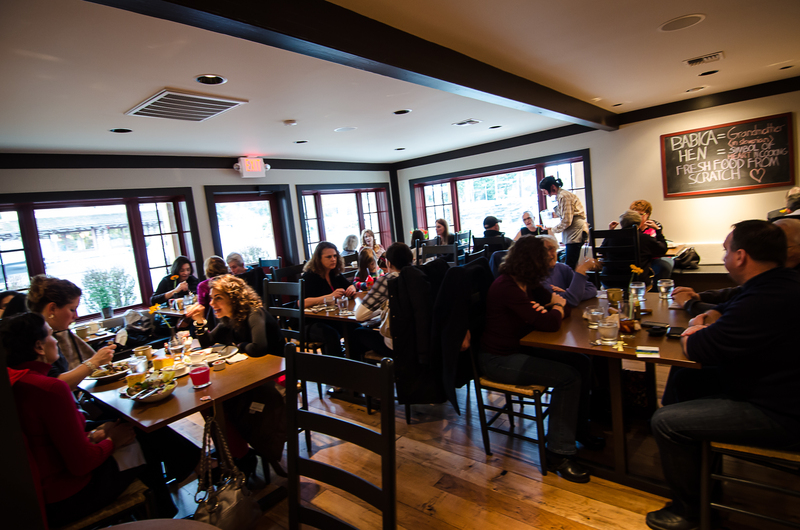 Also, once you’re at your table, don’t think the wait is over…our menus and beverages arrived almost immediately, and were attentively refilled. However, it was a good 15-20 minutes before our breakfasts arrived. I sense that Babica may have a bit more dining room than they have kitchen to support it. Luckily, both the service and the food made it worth the wait. 2) It’s not quiet. Don’t come here thinking you’re going to sip your coffee and think deep thoughts in peaceful silence…ain’t gonna happen. Sunday at 9:30am, the place was packed out and the noise level rated somewhere between rush-hour Starbucks (without the annoying tendency for grunge music) and a Jr. High lunch room. Again…not necessarily a negative. With an energetic five-year-old sharing our table, it was nice not having to say “SHH!” every few seconds, or be apologizing to those seated at nearly tables for impromptu bursts of “The wheels on the bus…” Add to that a decent selection of jr. menu options, and I rate it a “kid friendly” environment. 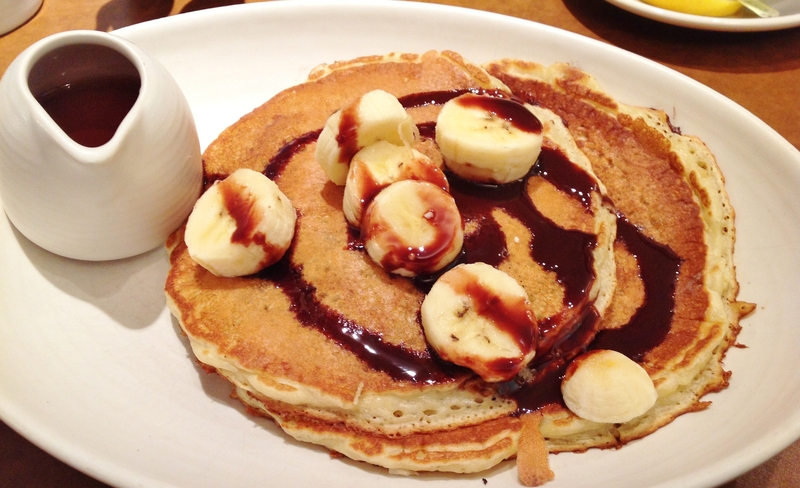 Gracie ordered the Chocolate Chip Banana Pancakes ($5). A bit sweet for this guy, but two sticky thumbs up from the five year old. Crispy chicken breast strips, with sweet potato mousse and rum caramel. Fried Chicken and Waffles ($10). This is what I came for, this is what I ordered, and make no mistake, this was very, very good, if a bit sweet for my breakfast tastes. The chicken was moist on the inside/crispy on the outside, just as it should be. The mousse was light, creamy and decadent, and perfectly suited to the caramel sauce. The waffles, on both dishes, were absolutely perfect. However, as a reviewer, I have a duty to my readers to taste every dish at the table (I do it all for you)…and, as good as this was, as soon as I tasted my wife’s order, I knew that my instincts had led me astray. Luckily, she (being a sweets girl) felt the same way, and a happy trade was made. 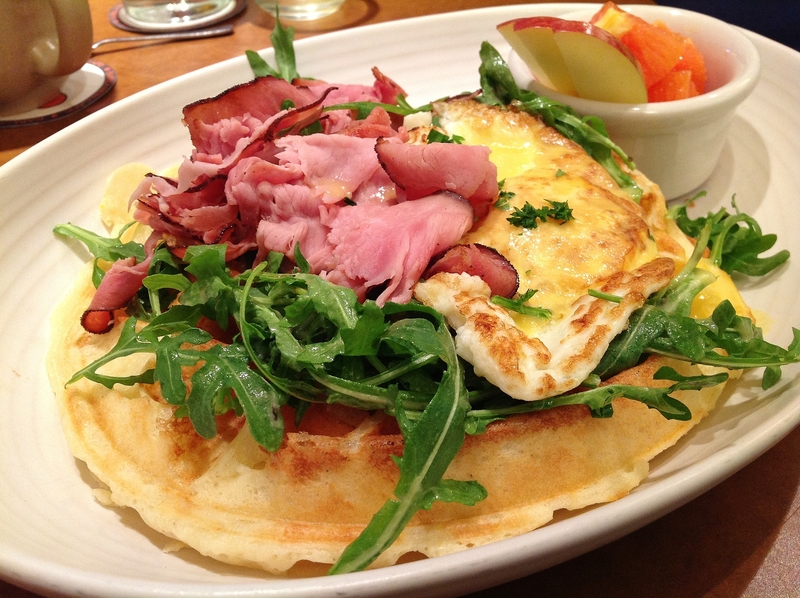 This…this dish right here…was one of the best breakfasts I’ve ever enjoyed in a restaurant. Anywhere. Ever. As a chef, tarragon hollandaise is one of my favorite go-to sauces, and these guys know how to make it…but it was the contrast in temp, texture, and flavor of the fresh, cold, crisp arugula, paired against the hot and savory of the rest of the ingredients, that took this whole dish over the top. Seriously, it was that good. Our server, Adrian, was a big part of what made this a great experience, as well. The place was packed, and every server was hopping and skippin’, but we never saw the bottom of our coffee cups, and every request and question we had was met with a smile, and a polite, even enthusiastic response. A sincere apology for the wait, made the wait much easier, and rescuing “the last caramel sticky bun” earned this guy hall-of-fame status in our book. From what I could see, this level of service was standard operating procedure with the rest of the staff, as well. Refreshing. 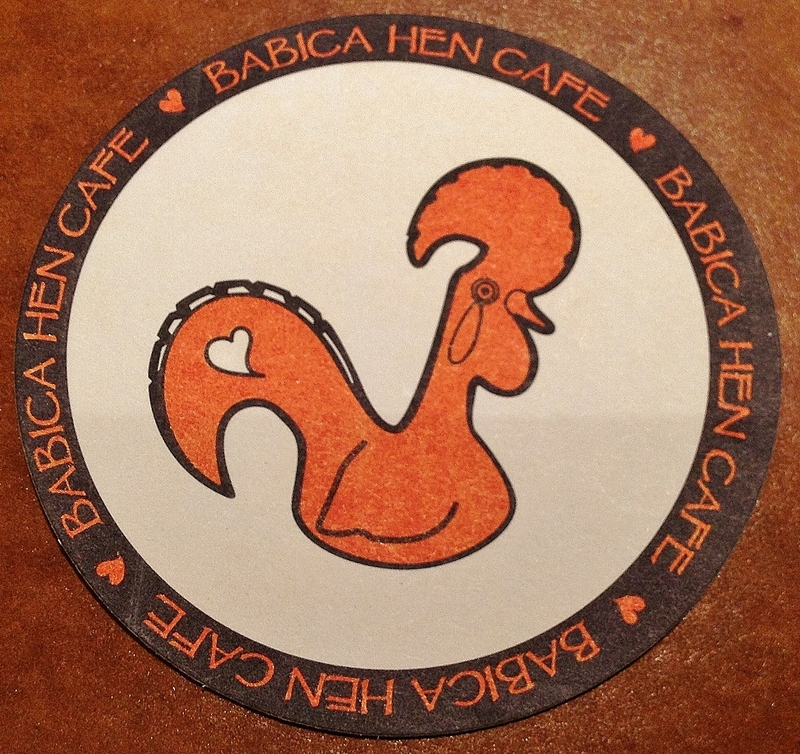 I’m looking forward to heading back to Babica Hen Cafe for lunch. There’s a Mad Beaver Burger (Painted Hills ground beef, mad beaver sauce, fried onions, and blue cheese on a kaiser roll, add bacon), and a Bloody Maria, using a house-made mix and 1800 Reposado (one of my favorite tequilas) that’s calling out my name! Join us for fresh breakfast and lunch made from the highest quality ingredients. 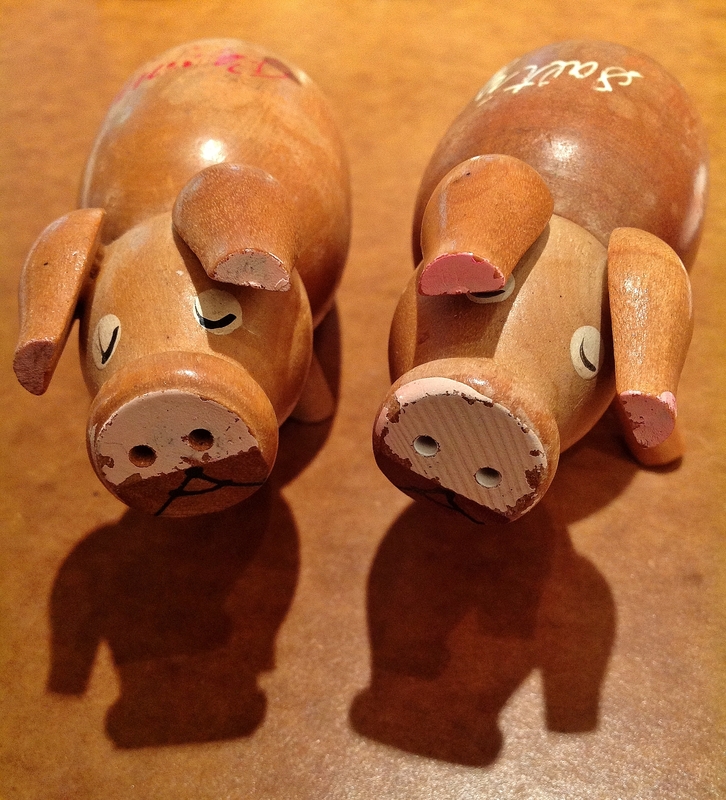 Our eggs are local and farm fresh, the pork pasture raised in Oregon and the beef all natural. We make our own sausage, batters, sauces, baked goods, and even the jam is made in house. We are passionate about good food! Babica Hen serves breakfast and lunch as well as fresh baked goods and great coffee.